For anyone who has spent the past 20-odd months living in Christchurch, the importance of a solid foundation is pretty obvious. Otherwise sturdy homes and other buildings were no match for ground conditions that turned into quicksand when the big shakes came along. People will be paying a lot more attention to things like geotechnical reports when looking at their next property purchase. Over the years various acquaintances from around New Zealand and further afield have come to visit our fair city and go for a ride. Unless they’re from some cycling nirvana like Copenhagen, invariably they’re amazed at the quantity and quality of what we already have on the ground for cycling. No, it’s not perfect (we can all think of our pet-hate locations), but occasionally we should stop to think what we do have. 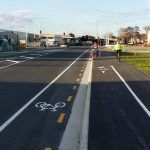 We already have over 150km of on-road cycle lanes and off-road cycle paths. Perhaps more importantly, that usually includes taking those cycleways safely through intersections, rather than stopping before them. In addition, we have hundreds of local streets that are also perfectly fine for cycling on; many have street treatments to slow down other traffic as well. Even on the main roads without formal cycleways, there is usually at least a shoulder or space of some kind to call our own (contrast with so many Auckland roads with four narrow traffic lanes wall-to-wall). And at the end of the trip, there are often a number of bike stands for us to park in. All of these things have helped us to hold our cycling numbers steady over the past decade. We also have the makings of a “cycle culture” within the city. It is not unusual for a lot of my colleagues to bike to work (as do over 6% of commuters) and to meetings during the day. Typically over 30% of the city’s residents have cycled at some point in the past month. 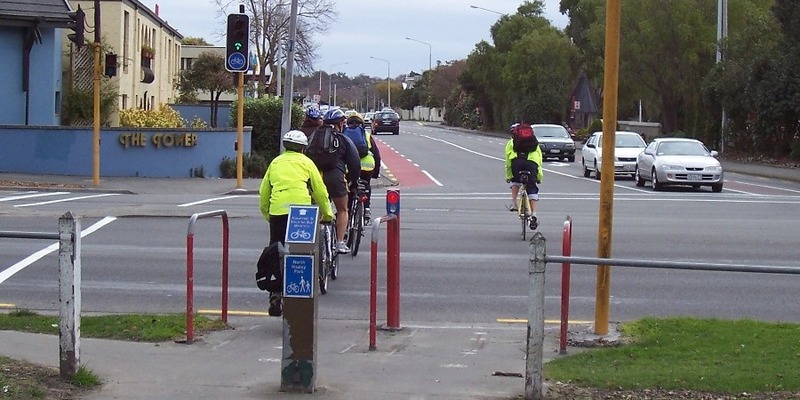 As a general rule I don’t encounter too much bad or aggressive behaviour from my fellow motorists in Christchurch; they know to expect to see people cycling and usually give me my space. This contrasts with other parts of the country where any cycle-related incident often leads to a flurry of vitriol via website blogs and letters to the editor. So, as we start to think how we want cycling to be provided for in our new rebuilt city, let’s build on what we already have.